President Muhammadu Buhari on Wednesday told British Prime Minister Theresa May that he is committed to conducting free, fair and credible elections. President Buhari said this during the bilateral meeting with the Prime Minister. He added that elections recently held in some parts of the country were successful, revealing his administration’s commitment to credible elections. He also welcomed UK’s support at strengthening democratic institutions in the country. ‘‘I assure you that I’m all out for free, fair and credible elections. I’m very pleased that my party is doing very well. The recent successes in polls in Katsina, Bauchi, and Kogi have boosted our morale greatly. President Buhari applauded British’s support to the country on anti-corruption campaign. He noted that the success of the anti-corruption fight was very important to Nigerians. He also thanked the UK government for the support on security and the fight against insurgency in the North Eastern part of Nigeria, as well as the improved trade relations between both countries. 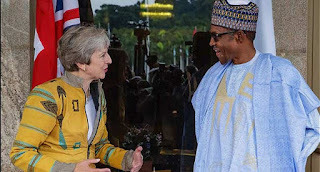 Prime Minister May in response welcomed the assurance by the Nigerian government on credible elections in 2019. She said she was pleased to be in Abuja to continue the ‘‘excellent discussions’’ which she started with President Buhari in London in April, this year, particularly on security, trade, asset recovery and the fight against corruption. During the meeting, both leaders also spoke about how to strengthen democratic institutions in the country. President Buhari spoke on the need for UK’s support on reviving of Lake Chad, which is a means of livelihood for millions of people. He said that Europe and China were already conducting an in-depth study on recharging the Lake through inter-basin transfer from the Central African Republic. The Prime Minister also appealed to President Buhari to use his position as ECOWAS Chair to keep the issue of human trafficking on the front burner in the sub-region.